start each season with a lecture to both the veterans and the sculpting rookies on the basics of football. He would literally hold up a football and say, “This is a football.” Then he'd extol the features of it and then talk about kicking it, carrying it, and passing it. Then he'd take the team out to the field and he'd say, “This is a football field.” He'd then tell them all about a football field and what you do there. Apparently, he did this ritual every year even after the Packers became NFL champions and won two super bowl contests. Just think how basic and fundamental this must have sounded to the veterans (and the rookies, too, probably), but this is one of the reasons that Vince Lombardi was such an all-time successful football coach: He never forgot the basics and he never let his players forget either. 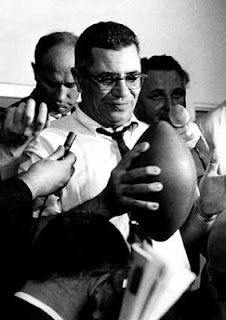 Now, if getting back to the basics is good enough for Vince Lombardi, it’s good enough for me. What does this mean for us non-NFL players? To answer this we need to take stock of what it is that we want to accomplish. One could write a very long article, book or course on the topic of the basics of physical fitness, but for the sake of brevity, (which I am not always known for); I will focus on the basic components of fitness as I’ve come to know them. The U.S. government, in its infinite wisdom, has finally said something that I agree with. That is that the term “physical fitness“ defies concise definition. I agree. It goes without saying that in order to place a label such as “physically fit,” on someone we must be able to quantify that in some way. So while a concise definition remains elusive, we can certainly narrow things down a bit. Furthermore, we can, or at least I can, share my own definition of physical fitness as it relates to these six components. This is important. How can you value certain standards or benchmarks, if you don’t understand what they’re being compared to? How do you know where you really stand? Cardio-Rather than embark on a mission to research the origin of our current understanding of what cardiovascular fitness is, I suggest we starting by looking back just 23 years-to when I got my start in the fitness business. Back then, the common belief was to jog, “do” the Stairmaster or bike (or later the Elliptical) for at least 30 minutes (45-60 was even better) at an even pace that made you sweat but wasn’t so difficult that you couldn’t pass “the talk test” (being able to carry on a conversation while continuing your cardio.) This insured that you were exercising in “the fat burning zone.” For years, all fitness magazines, women’s magazines and health magazines recommended this type of cardiovascular activity as it was believed to be the optimal method for burning fat. No one seemed to care about things like improving cardiac output, lung capacity or general heart health, nor did they notice that we were starting to grow larger and fatter by the year. I read the magazines, the studies, listened to the experts, but I always had this nagging suspicion that exercise was supposed to include exertion. What seems too good to be true, usually is. Thankfully, we’ve evolved past the ridiculous-the long duration, moderate intensity “cardio” (unless you’re addicted to running, in which case I don’t think you’ll ever come around to our way of thinking.) Regardless, we now know that the best way to burn fat AND obtain a respectable level of cardiovascular fitness is to engage in high intensity burst training. Burst training is not the same thing as interval training although they are cousins. Burst training involves an all-out sprint that is done with 100% effort for 30-60 seconds at time or rather, as long as it takes to be unable to continue the activity. In other words, if you can last longer than 60 seconds at this intensity, you’re not working hard enough. This effort typically translates to a maximum heart rate of about 85% but that’s not important-unless you believe that exercising your heart at that intensity will make it explode. Don’t laugh, I actually had a likely young and inexperienced trainer approach my client at a gym and caution her in this way. I guess he’s never seen the Olympic games or even a track and field meet. A burst can be done with any mode of “transportation.” You can sprint on a treadmill (flat or uphill for added intensity), a bike, an elliptical, and there is even a way to do it on a Stairmaster. Bursts can also be done on the grass in the great outdoors, or as a cycle sprint on a roadway, a jump rope interval or using body weight exercises (think burpees)-these all work very well. The difference between interval training and burst training is this: interval training has specific work to rest ratios i.e. 1:1 which equals one minute of cycle sprinting followed by one minute of rest or 30 seconds of work followed by 30 seconds of rest. Then repeat for 12, 15, 20 minutes or whatever the specified period of time is. Burst training does not adhere to specific timed intervals that the body can readily adapt to; you simply go...until you can’t. My colleague Jade Teta calls it “rest based training” because the entire concept revolves around pushing yourself at a very high intensity until you’re forced to rest. This type of exercise is safe as it is inherently self-limiting. It is also relative. One man’s burst is another man’s walk-in-the-park.